Memories of the Future, a collection of stories by Sigizmund Krzhizhanovsky, was among my favorite books of 2010. Krzhizhanovsky was a 20th century Russian writer of absurdism, surrealism, magic realism, and science fiction. Bad luck and Soviet censorship kept all but a handful of stories out of print in his lifetime. His work was buried in an archive to be unearthed decades later. The NYRB classics imprint has begun slowly translating and publishing his work in English. The Letter Killers Club is a novel and a frame for several stories, quasi-stories, and narrative fragments. I could say many of the same things about it as I said about Memories of the Future–the prose is startling, the ideas come at rapid fire, and Krzhizhanovsky draws vivid characters in very few strokes. I’ve seen Krzhizhanovsky compared to Borges and Kafka, but he reminds me more of Stanisław Lem. The Letter Killers Club recalls A Perfect Vacuum, Lem’s volume of reviews of nonexistent books–conceptions of books that don’t exist and don’t need to because Lem boiled them down to their essences. The narrator of The Letter Killers Club is friends with a famous author who for two years has written nothing. One night, the author explains: in his youth, a financial emergency forced him to sell his library. He afterwards spent hours reimagining the books that stood on his empty shelves, and in doing so found the inspiration to write books of his own. Years later he acquired a case of writers block and returned to what worked before, setting up a room of empty shelves. But now he found he preferred keeping his ideas in his imagination: fixing his conceptions as letters on a page killed them. Now he’s the president of a club of “conceivers,” the Letter Killers Club, who gather every week to share stories that will never be set down on paper. He invites the narrator along. By the end of the first chapter you might expect a straightforward collection of club stories. But the meetings of the Letter Killers Club are… intense. The conceivers use nonsense-syllable aliases and skulk in like they’re attending a combination conspiratorial conclave and Ph.D. thesis defense. If a conceiver is gauche enough to read from notes, the president throws them into the fireplace. The meetings aren’t so much storytelling sessions as conflicts. The audience seems anxious to challenge the speaker–each week’s featured conceiver is on trial. The stakes are left unspoken. They feel pretty damn high. Krzhizhanovsky is dealing with the same preoccupations that dominated many stories in Memories of the Future: writers with no outlet for their work, stories treated as matters of life and death. One story in Memories of the Future argues that writing isn’t just an occupation but the thing the writer owes the world, payment for his or her existence. That’s serious. You can’t blame Krzhizhanovsky for coming back to these themes. They’re his life. Barring those few precious published stories, the only people his writing connected with were the audiences who gathered to hear his own private readings. He had no publisher, and he must write, and I sense in his stories a feeling of bottled-upness. The malaise that hangs over the Letter Killers comes from their inability, or refusal, to fulfill their purpose. A story never read is never complete. The conceptions vary in tone and content. The longest story, and the one that most put me in mind of Lem, is a science fictional tale of a machine, the “ex”, that can posses people’s bodies, working them like puppets, leaving their minds aware but sidelined like passengers in vehicles out of their control. At first its creators sell it as a way to deal with the insane: their care is an economic burden, goes the argument, but putting them under the control of an ex will turn their bodies, if not their minds, into productive workers. As you might expect in a story like this the exes’ influence spreads. They become the tools of a government that sees citizens as economic units rather than human beings. Another story deals with an actor playing Hamlet who enters a world inhabited by previous performances of Hamlet to steal Richard Burbage’s mojo. Another is about a priest moonlighting as a jester, changing costumes as needed, whose career goes haywire when his vestments are stolen. With the dystopian tale, they share a thread that runs through some (though definitely not all) of the stories in The Letter Killers Club: the mismatch between the outer and inner life, actors and the parts they play, people’s real selves and the roles imposed by society. Like the characters in these stories, the Club members live in a world that expects one kind of story from people with other stories inside them. The Letter Killers Club doesn’t pay much attention to the world outside the president’s doors, but you can’t forget these people are meeting in the Soviet Union–near the end one member observes, in reference to the empty shelves, that the police can’t search what isn’t there. The members of the Letter Killers Club can speak their ideas in their empty library, but can’t give them to the outside world. The friction between their inner selves and their outer roles is wearing away at them. Apparently five volumes of Krzhizhanovsky’s collected works have been published in Russian. I hope we don’t have to wait long for more to appear in English. His writing spent too long bottled up, and deserves to be read as widely as possible. The best science fiction/fantasy collection of 2009 was a book of 80-year old stories: Memories of the Future by Sigizmund Krzhizhanovsky. If anyone out there knows how to pronounce “Krzhizhanovsky,” leave a comment. I’m really curious. Most of Krzhizhanovsky’s stories are fantasies of the kind filed under “magic realism.” “Memories of the Future” is flat-out science fiction, written in reaction to H. G. Wells’s The Time Machine . All of them are way the hell better than anything American SF writers–I guess at the time they would have been “scientifiction writers”–came up with in the 1930s. Project Gutenberg has been digitizing early out-of-copyright issues of Astounding , and, let me tell you, trees should not have been reduced to pulp for that dreck. I can’t help but wonder what would have happened to the SF genre if Krzhizhanovsky had slipped past the censors, if he’d been translated into English, if his stories had reached western SF writers and shook it awake a little. Could the New Wave have hit the shore thirty years early? When SF fans talk about writing, someone usually shows up to promote “transparent prose.” “Transparent prose” is writing notable for its unwillingness to impinge on the readers consciousness. It’s a “window” onto the story; you read through it. I think this kind of prose is okay, if not exciting. It’s a good minimum standard. Great writing is always doing at least two things at once. On the surface Krzhizhanovsky tells stories; subconsciously, his style tells us how he felt living in the Soviet Union. Krzhizhanovsky frequently uses synecdoche when referring to people–“briefcases,” “the earflaps,” “a five-digit number that had promised to put in a word to the right people.” People seem reduced to objects, functions; we’re also reminded of fairy tales and parables of inanimate objects that act out human failings. Some stories progress through the abrupt shifts and transitions of dream logic. Krzhizhanovsky’s world, like Stalin’s, is ruled not by sense but by arbitrary fiat. Krzhizhanovsky’s stories weren’t published until 1989. He couldn’t get them past the censors. He had to content himself by holding readings while working a day job as an encyclopedia editor. So it’s not surprising that Krzhizhanovsky is preoccupied with the difficulties of being a writer in the Soviet Union. The star of “The Bookmark” is a frustrated writer, a “theme-catcher” who spins stories from the smallest hints–a cat on a ledge, a wood shaving blowing by in the wind–but has no outlet for his stories beyond telling them to acquaintances and passers-by. The theme-catcher goes to a Soviet publisher with a book called Stories for the Crossed-Out . “Are you one of the crossed-out or one of the crossers-out?” asks the editor. Someone “able to cross things out” would be more in line with the times. Another editor invites the theme-catcher to write something safe: a biographical sketch on “Bacon.” The theme-catcher asks which one. The editor, surprised, tells the theme-catcher to write about “The Brothers Bacon.” The theme-catcher points out that Roger and Francis Bacon lived three hundred years apart. The editor screams “You’re all of you alike!” and storms out of the office. I think this is autobiography. The way the editor covers his embarrassment with sudden, wild hostility has the ring of truth. In the Soviet Union, good Party members were rewarded with jobs they were totally unqualified for. It was a nation of Heckuvajob Brownies. I’ll bet Krzhizhanovsky dealt with these guys all the time. The narrator of “Someone Else’s Theme” meets another down-on-his-luck writer named Saul Straight who’s come up with a “theory of separation.” Lovers, says Saul, should be forcibly separated: weak, imitation love will fizzle; true love will grow stronger with distance. Saul has a lot of ideas like this. He’s provisioned with philosophical ramblings and not much else. When the narrator meets him, he’s trading aphorisms for food. But the narrator of “Someone Else’s Theme” isn’t the author. The narrator passed his story to another writer–presumably Krzhizhanovsky himself–who’s told the narrator’s story in the narrator’s voice. Now Krzhizhanovsky is faced with a problem: how can he gracefully transition back to his own voice? And writing within the limits imposed by authority, buried in someone else’s themes, how can he hold on to his own “I”? These stories aren’t all about writers. “Red Snow” is about coming home to find a light in your apartment window. That might sound reassuringly homey. In the Soviet Union it was bad news. “Red Snow” is the most nightmarish and disorienting story in the collection. “Quadraturin” is about the apartments themselves. In the early days of the Soviet Union masses of population moved from the country to the cities. Housing was scarce. The government turned people’s homes into communal apartments; people who’d lived in a place for years found themselves living in a couple of rooms while strangers were installed in other parts of the apartment. Sometimes entire families lived and slept in one room. According to the introduction, Krzhizhanovsky himself thought it worth noting in a letter when he discovered a way to stretch his legs while sitting at his desk. “Quadraturin” is a Moscow apartment-dweller’s fantasy–more room!–that goes horribly wrong. “Quadraturin” is about space; “Memories of the Future” is about time. The USSR was a jam-tomorrow kind of place. Comfort, abundance, and luxury goods were waiting at the end of the five-year plan–all it would take was a little shock work. And then a little more. Somehow the good times remained out of reach. Soviet citizens lived in, and for, a purely theoretical future. So, in a way, does Max Shterer, the mad scientist at the heart of “Memories”–which really is one of the great time travel stories, one that would have influenced the genre if life were fair. Max’s big ambition is to build a time machine. He’s born into a comfortable family around the end of the 19th century, sent away to school, drafted into the Great War, stuck in a German POW camp, and disinherited by the Revolution. Max barely registers any of this. He’s thinking about his time machine. Eventually Max builds his machine, leaps forward, and finds… something. The climax of “Memories” is stunning, not despite but because we’re not entirely sure what Max sees. 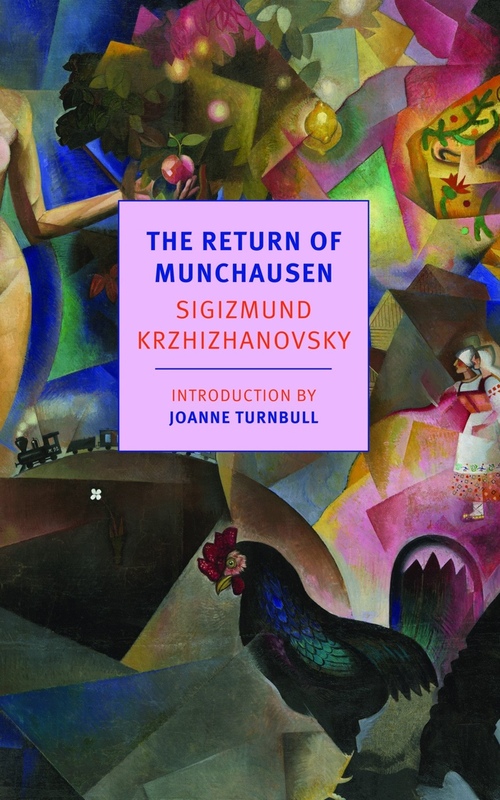 This is a time travel story written like a ghost story: what’s implied, what we imagine, is scarier than anything Krzhizhanovsky could have described outright. No wonder this story didn’t get the Soviet stamp of approval: the future feels less like a time and place than a Lovecraftian monster waiting to swallow the Russians who lived for it. When Memories of the Future was reviewed in the New York Times the reviewer complained that Krzhizhanovsky’s “refusal to wake to the reality of his times can fog the clarity of his visions.” This is dumb. Krzhizhanovsky is engaged with the reality of his times; he engages it slantwise, through metaphor. And the times Krzhizhanovsky lived through were in many ways unreal. I can’t blame him for turning to the literary equivalent of lobster telephones and melting clocks. If he wanted to keep his grip on reality, surrealism might have been his best option.